An ignition coil is a transformer which is used to convert and provide the spark plug with enough electricity so that it creates a spark and starts the engine. It is a key component of the car’s ignition system and if found faulty, your car will not start. Any problem with the ignition coil wouldn’t allow the car to start making drivers believe that there is some serious problem with the engine, whereas its just the ignition coil which needs to be replaced. In this article, we will look at the symptoms of the bad ignition coil and what preventive steps one could take a long life of the ignition coil. The purpose of the car’s ignition system is to produce a high voltage from the car’s battery and transfer this voltage to the spark plugs. Using the voltage, the spark plug will ignite the fuel-air mixture and start the engine. What is the Role of an Ignition Coil? 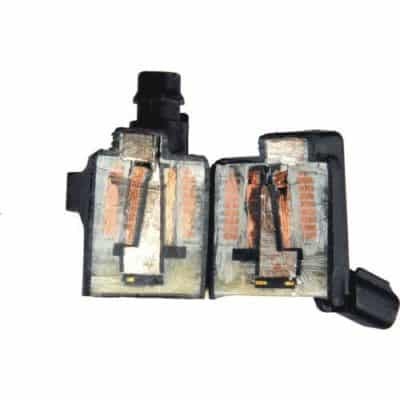 The ignition coil is basically a high voltage, a low current transformer that extracts voltage from the car’s 12-volt battery and converts it into 25-30,000 volts which are needed by the spark plug to ignite. The most common problems of a bad ignition coil are misfires from any of the affected cylinders. Misfires can result in further damages to other parts like the catalytic converter or the O2 sensors. You can experience more different symptoms from misfires also. The check engine light illuminates whenever there is some problem with the engine. Since the ignition coil directly affects the engine’s functionality, the check engine light starts blinking if there is a problem with the coil. If you have noticed any of the below-mentioned symptoms along with check engine light, then most likely the issue is with the ignition coil. Engine backfiring is noticed at early stages of ignition coil failure. The backfiring occurs when the internal combustion cylinder has unused fuel remaining and it flows through the exhaust pipe. This also results in black smoke coming out the exhaust pipe and bad smell of gasoline indicating that there could be a problem with the ignition coil. It is recommended to fix this problem right away to avoid damage to the exhaust system. Driving at a regular speed, if you notice that your engine stalls after a couple of miles, then there is a possibility that the ignition coil is faulty. Engine stalling occurs when the ignition coil supplies irregular current to the spark plug. If not fixed right away, your car might completely stop after a few miles. Due to a faulty ignition coil, more power is supplied to the spark plug and as a result, the engine will use more fuel. This causes a drop in the mileage indicating that the ignition coil needs to be checked. A faulty ignition coil does not generate enough voltage for the spark plug as a result, the engine works harder than usual. This results in excessive engine noise and vibration. A damaged or faulty ignition coil can prevent the engine from turning on completely. If you hear a clicking sound when starting the car, then the problem is not with the ignition coil. However, if there is absolutely no sound, the possibility is that the ignition system has failed. An ignition coil can be easily tested using a digital 10 megaohm impedance ohmmeter. Connect the ohmmeter’s two test leads to the ignition coil’s positive and negative terminals. The average reading is somewhat between 0.4 and 2 ohms. If the ohmmeter shows zero resistance, it means that the coil is short. Whereas, a high resistance reading indicates an open coil. Another great way to check the ignition coil is using a spark tester. A spark tester is available on Amazon for a cheap price. To check the ignition coil, turn off the engine and disconnect the coil from the spark plug. Connect one end of the spark tester to the top of the spark plug and another end to the coil output. Once the spark tester is in its place, start the engine to check if a light flashes on the spark tester. If it does, then the ignition coil is working effectively, whereas no light indicates that either the ignition coil or the oil control circuit is damaged. Step 1: Disconnect the car battery by removing the negative terminal. You’ll need an appropriate socket or wrench to unscrew the bolt. Step 2: Find the ignition coils which are typically located on top of the engine and attached to the engine block. Step 3: Remove the old ignition coil with the help of a socket wrench and disconnect the electrical connectors from the coil as well. On some cars, it is required to disconnect the electrical connectors first and then removing the coil. To know more, refer to the instructions on your car manual. Step 4: Install the new ignition coil and ensure all bolts and screws are tight enough. If you removed the electrical connectors first, then reconnect them and then install the ignition coil. Step 6: Start the car and take it out for a spin to ensure that there is no idling, stalling or engine misfire. Replacing the ignition coil is simple, however, if you are not comfortable in doing it yourself, head over to the auto mechanic and let the experts do the job. The average cost to replace the ignition coil is between $150 to $270. The ignition coil itself costs approximately $120 to $160.